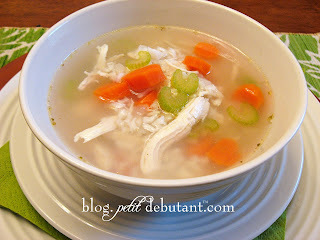 There's nothing like a bowl of homemade chicken soup on a cold rainy day! I add celery, carrots, onions, a handful or two of rice and a squeeze of lime just before serving. For the grownups a couple of dashes of hot sauce kicks it up a notch. Nothing like some Tapatio to clear out any stuffy noses! My first glance, I thought it was Yucatacan Soup. It has fried tortilla strips instead of rice or potatoes under it. (I don't normally eat chicken, but this was in Mexico and I wouldn't have dreamed of offending the host) We added some hot stuff to it also. Mmmmm. I would make it with turkey (which I DO eat) instead of the chicken. Looks hearty! I love chicken soup. I like to add noodles to it! rico's aunt adds evaporated milk..gives it a creamy taste! yum! Soup does taste good on cold rainy days. It's also tasty when your under the weather. I have a crawfish chowder recipe that is really good, it has a little kick to it.